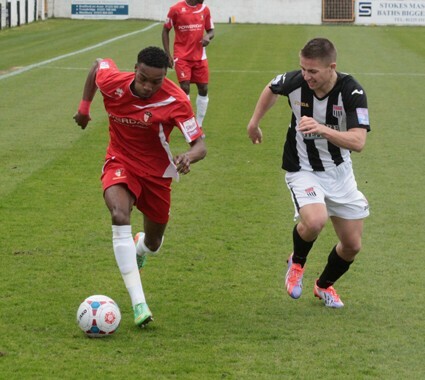 Desperate luck denied Hayes and Yeading United any points in their relegation fight just when it seemed that they'd claimed all three as a huge stoppage time penalty appeal at one end immediately preceeded Bath City's winning goal at the other. United immediately went on the attack with Luke Williams finding Freddie Ladapo whose 20 yard shot was saved comfortably by Stuart Moore low to his right. Minutes later, United took the lead. Kamaron English and Rashid Yussuff combined well on the right flank before the latter found Luke Williams in space. His cross was aimed at Pat Cox, but although he was in the vicinity, and was credited with the goal by the stadium announcer, he couldn't quite reach it and the ball actually went in off the midriff of Bath defender Sekani Simpson. The home side took some time to respond, but when they did, they were inches away from equalising, as Josh Low hit a rasping volley which cannoned back off the post. Low also brought about Mikhael Jaimez-Ruiz's first save when connecting with David Pratt's centre, although it was a comfortable one low to his right. He then saved from Noah Keats when the speedy Bath midfielder capitalised on some hesitant defending and broke through the defensive line, only to shoot too close to the Venezualan stopper. Bath got their equaliser in slightly controversial circumstances on 34 minutes. A corner was drifting over a crowded penalty area and as the ball bounced high, both Dean Inman and Pratt swung a foot at it. Referee Mr Rock deemed this a foul on Inman's part and awarded a penalty which Pratt took himself. Although Jaimez-Ruiz guessed right, the pace on the ball just beat him. Soon afterwards, Bath were close to turning the game around completely as Low collected a deep cross and fired a fierce shot back across goal which just missed the far post. At the other end, Yussuff found Cox with a throughball but his shot on the turn was blocked by Adam Connolly. Phil Babb was clearly keen to stem the tide of Bath attacks and at half time, he decided to sure up the midfield with introduction of Frankie Merrifield. However, the first chance fell to Bath as former United player, Phil Walsh headed Andy Gallinagh's deep free kick just wide. 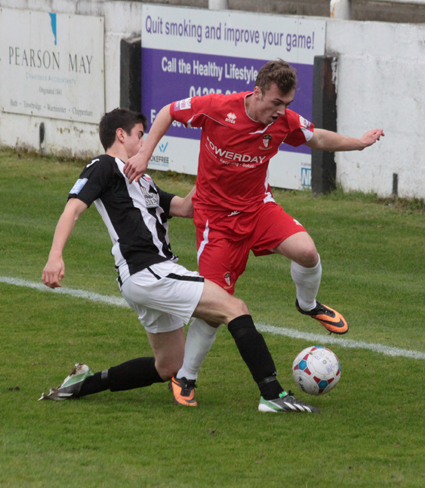 It was also thanks to Adam Everitt that Pratt didn't claim a second of the match, his brave block denying the forward from close range. Play hit a lull, although Low took advantage of a loose pass in the United defence but dragged his shot across goal. United responded with a spell of pressure, and Ladapo wriggled free down the right channel only to blast his shot just over the bar. On 72 minutes, a swift breakaway for United caught the home defence undermanned and this led to Babb's side retaking the lead. Matty Harriott carried the ball into the opposition half and found Merrifield in space. The midfielder worked his way to the edge of the area before laying the ball back to Cox who slammed the ball into the bottom corner beyond Moore's despairing dive (photo right). For a while, it didn't seem likely that the home side would respond, but on 84 minutes Pratt left Jaimez-Ruiz standing with a bullet header from a left wing cross to again draw the Romans level. Then came the major controversy as it appeared a clear handball block by Gallinagh in the penalty area from Niall McManus's overhead volley denied United a chance of a winner from the spot as Mr Rock waved play-on. It became even more galling as Moore cleared the ball and immediately Andy Watkins was through on goal and applying a finish to the bottom corner. Still, United battled on. Williams put Cox through on goal but shot he too close to Moore. Then Harriott hit a rasping 25 yard shot which curled inches wide. However, it wasn't to be, and United will be hoping for better luck in their next visit to the south west on Tuesday at Dorchester. United Man of the Match: Pat Cox.